Now opening at noon for member sale! The Book Sales are fundraisers held twice per year in April and November. To make them a success, your donations are needed and can be accepted throughout the year. Small quantities may be left at the library circulation desk at the Cape Coral Library located at 921 SW 39th Terrace. Tell them it’s for the book sale. Please don’t leave donations in the book drop, since staff may not know they are donations. 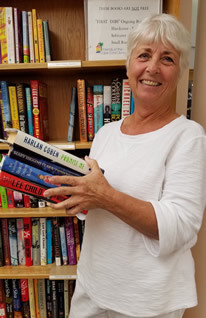 For larger quantities you can arrange for a pickup by leaving a message on the Friends hotline at (239) 349-2572 or email our Book Sale Coordinator. We’re a 501(c)3 non-profit volunteer organization that funds library programs, services and goods not covered by county library budget. Donations are tax deductible. Friends Members have access to the sale preview, held the evening before the sale opens to the public. Join at the door, or join now online to be ready for the next sale! The First Dibs Bookshelf is available daily inside the library with popular used hardbacks and paperbacks for sale. Look for the bookcases to the right of the entrance, facing the reference desk (near the entrance to the meeting room). Payment is on your honor, deposit the money in the wooden box on the shelf.